1) For your Caseload Manager to calculate the balance due on a case, you will need to first determine how much you want to charge for the case and then input your billable hours. 2) Your Case Types will open in a new window. 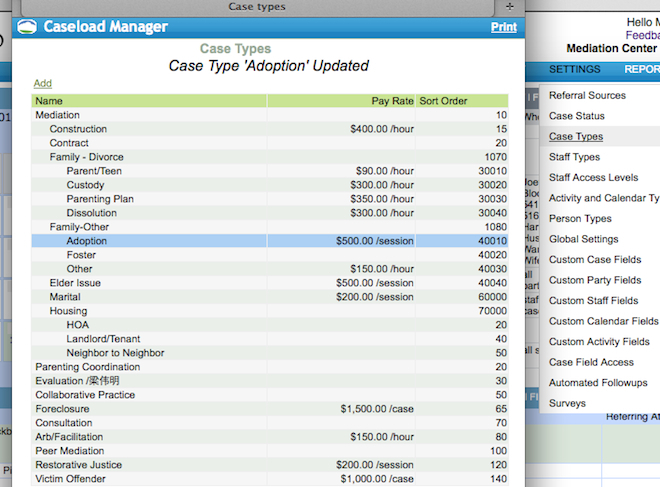 To add a pay rate to an existing case type, double-click that type. 3) That Case Type's window will pop open. Determine if this type will be charged per hour or per session. 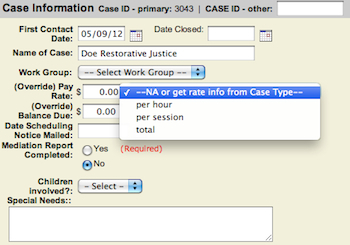 Type the amount in "Pay Rate" and select the appropriate per hour or per session field. 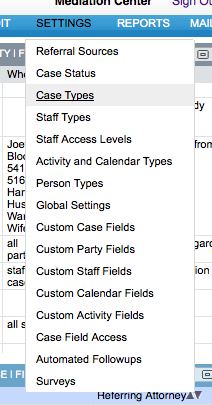 Click "Update Case Types Record." Close this window. 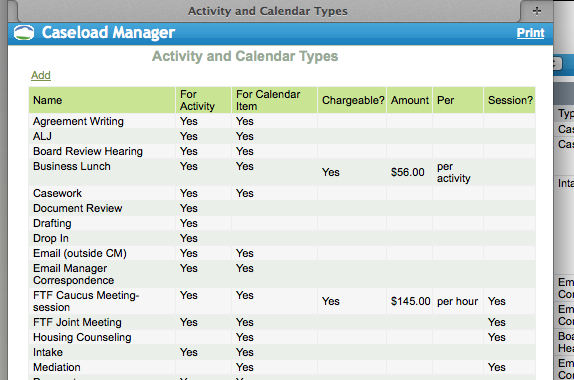 4) *If you charge by Session: Click SETTINGS > Activity and Calendar Types. 5) If you are charging per session (instead of per hour), verify in your list of calendar types that your type is considered a session. In the column that says Session?, make sure your item says Yes. 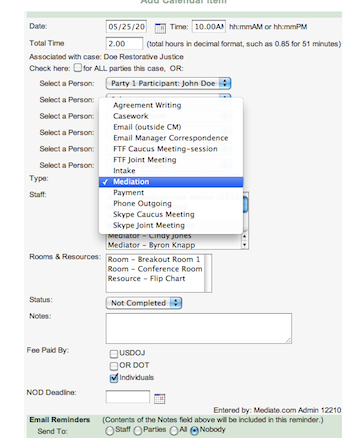 6) If not, simply click on the desired calendar type (Mediation, meeting, caucus, etc. ), and check the box "Does this consitute a 'session'?" 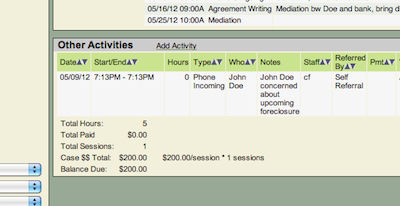 This tells this program to bill for this item as a complete session instead of on an hourly basis. Close this screen. 7) Open the case for which you want to determine the balance due. 5) Add your calendar items. Remember that if you want this item to be charged by session, you have to have told the program to charge it as a session (Steps 4, 5, and 6). Remember to select the appropriate calendar item so that it will charge. 6) In your Case Record, the total hours and sessions will automatically be calculated. The program will create a charge for these with the pay rate you assigned. It will create a total due. It will then subtract any payments received. This will give you a final Balance Due. 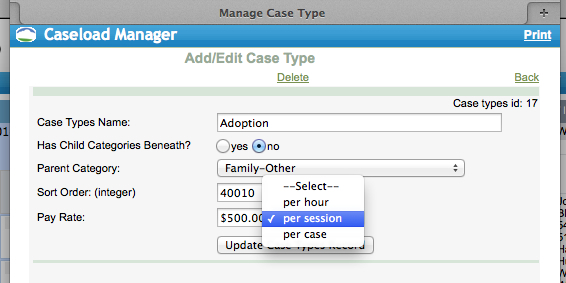 7) If you ever need to override this amount, simply input the total or the new pay rate for this case in the override fields in the upper-left of your case record.